One week to go before spring break. But who’s counting? Certainly not me. Certainly not the kiddos. More Right Triangle Trig this week as we barrel towards our unit exam and spring break. 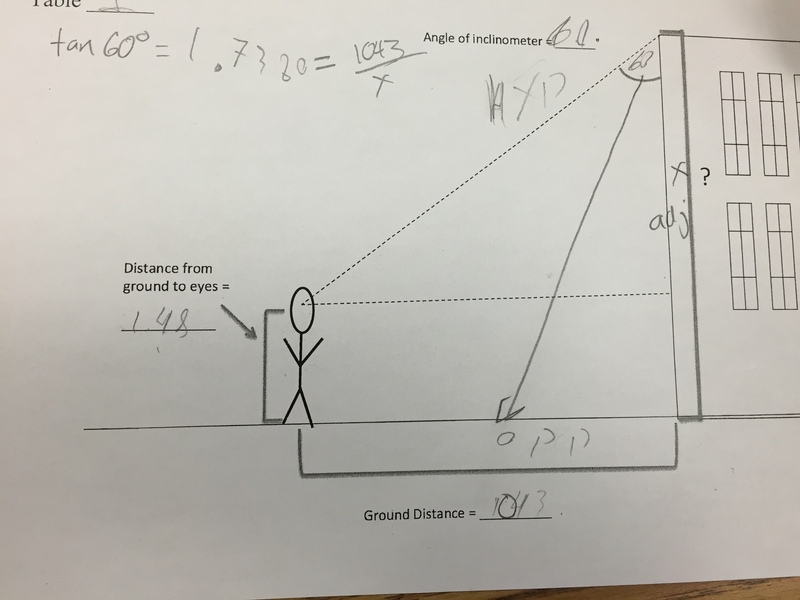 We’re back into a routine of doing problems in class, which feels a little less crazy than trying to go outside to measure the school. Photo: The Challenge Problem With Two Reference Angles Don’t let the wording fool you; this was a problem that everyone did. Kiddos seemed to struggle with it and the idea that there can be 2 reference angles. They also struggled quite a bit with how the ratio changes with the angle. Most kiddos figured out that the sine of one angle was the same as the cosine of the other angle in the triangle, but often couldn’t explain why or point to the corresponding angles in the diagram. That being said, most students did eventually find the distance of the ramp. In one of many questionable teacher moves, I ended up giving the 2nd challenge (an inverse sine problem, which students seem to find easier) first, which gave students a little bit of confidence. Graded the rest of the picture projects this weekend. Nearly ended in me being a babbling mess amidst other math teachers. And yes, these are the projects from, uh, a month ago. Students seemed to recognize them when they got them back, which is good. I am now about to grade as many homeworks as I can in hopes of getting printed progress reports to students tomorrow. I want them to be aware of grades, but am also worrying that we are pushing them to thinking about grades instead of knowledge. Sigh. Out on Thursday for a planning day. Sub day went OK – most kiddos worked and one of the ones who was not fantastic the last time was much better. That meant that Friday’s lesson was extra crammed (the other class got 2 days to do it, so we went a little faster in order to keep up). Whereas the other class spent one day measuring the angle between the ground and the sightline to the top of the school with an inclinometer and then one day writing about their results, we did both in one day. Which was quick but doable. Photo: Estimating the Height of the School One of the phrases that I hear teachers at my school use a lot is “What do our students understand? 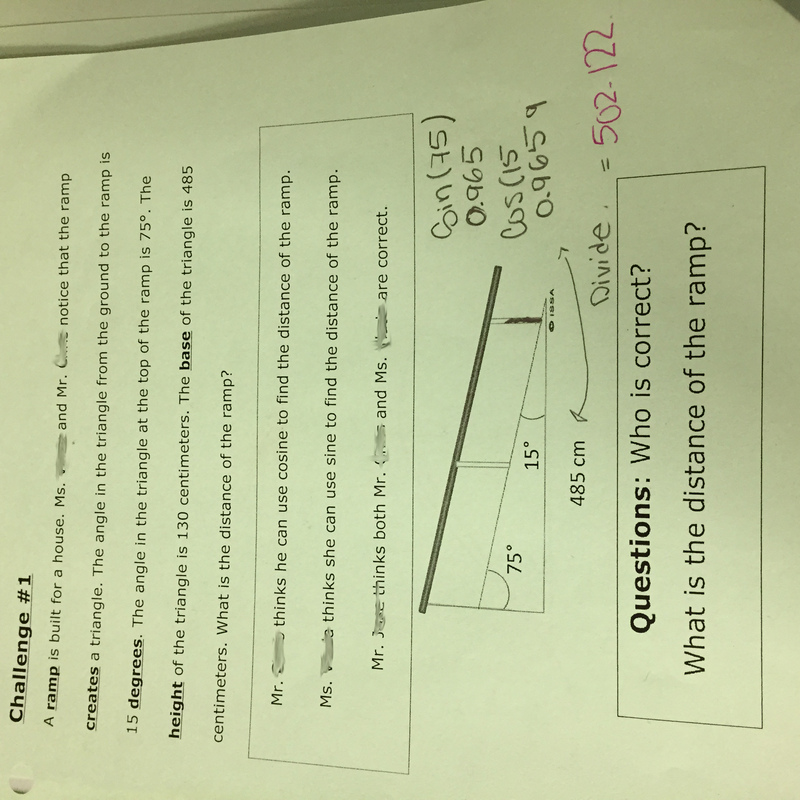 What are they capable of?” It’s interesting to see where this goes with right triangle trigonometry. Finding the opposite side and the adjacent side seemed easy enough. But now there’s a lot of other little details: solving ratios, identifying hypotenuses, figuring out how the opposite and adjacent sides change as the reference angles change. For many kiddos, identifying the current ratio (sine, cosine, tangent) and setting up the equation feels successful. 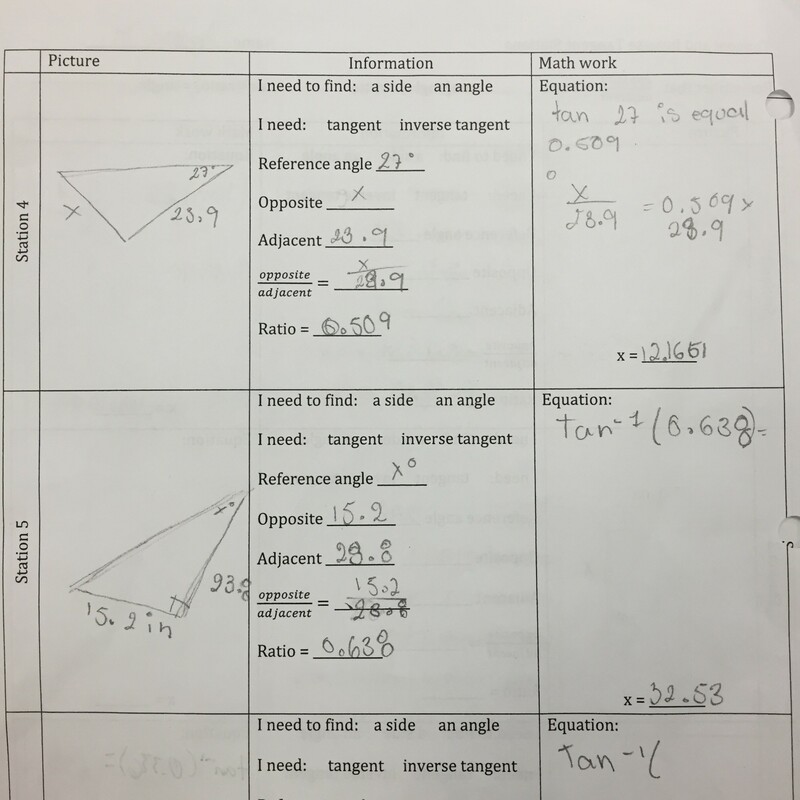 This student work shows students who (with a lot of help) were able to identify the opposite and adjacent sides and set up the tangent ratio. It was late and we were out of time, so we didn’t actually solve the ratio. But I like that the students were able to show what they know. We’re midway through a unit on right triangle trigonometry. There were some struggles in the beginning, mostly with the procedural process of solving ratios and estimating scale factors (tricky for kiddos with interrupted formal education), but it feels like things are back on track. Having learned about tangents and inverse tangents last week (the latter on a Friday, where many kiddos were absent on a field trip), we decided to have the kiddos work through a series of stations. 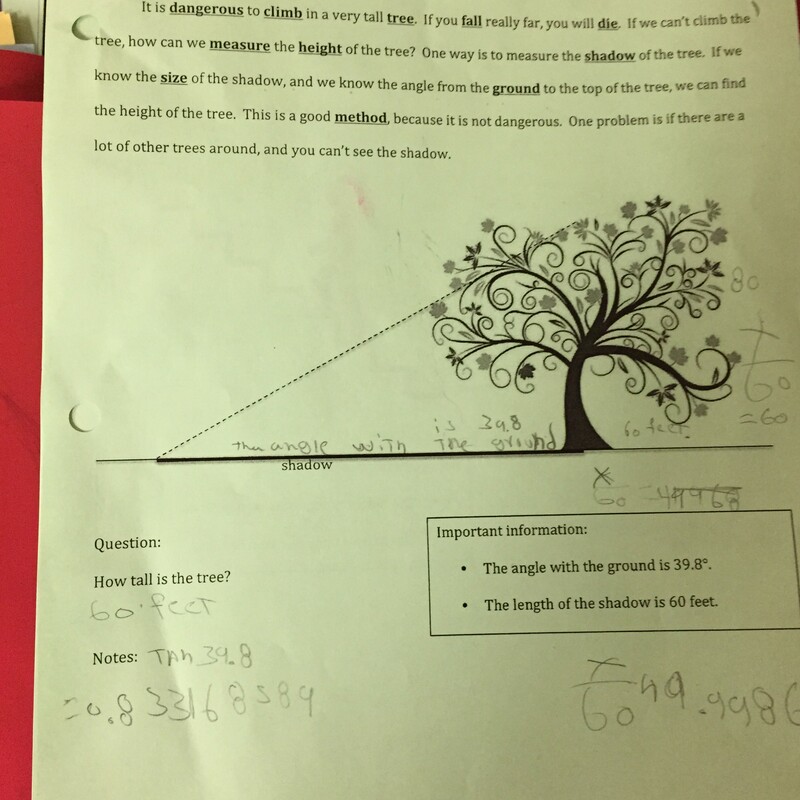 They had to draw pictures, write the parts they knew (reference angle, adjacent side, opposite side, etc) and then solve for the missing side or angle. Still running into issues with solving ratios, but we’re making progress. I’m also helped by an instructional coach who wisely reminded me to make expectations clear and reminded me that if I’m in a mood, my students are probably going to be in a mood. I know this (ostensibly) but it’s always nice to be reminded. Daylight Savings Time could not get here fast enough. I know John Oliver and most of Facebook disagrees with me (past me disagrees with me, even), but it does wonders for my mental state to get home and go for a run while it’s still light out. By coincidence, I have 3 sub days in the next 3 weeks before spring break. Which is simultaneously great and…terrifying.